Join Site24x7 leader, Ms. Rajalakshmi Srinivasan, to learn about AI-driven monitoring solutions for DevOps and ITOps. Site24x7 has recently introduced AI-powered monitoring to enable IT teams to manage over 100 products covering databases, compute, storage, network, analytics and security. AI-powered insights decrease application outage resolution time. Site24x7 AIOps: The way to quicker incident remediation and decision making for a smooth end-user experience. Ms. Rajalakshmi Srinivasan, Product Manager & Evangelist, Zoho Corporation Pvt. 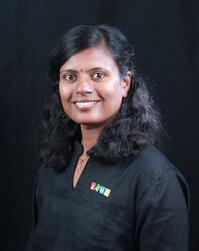 Ltd.
Raji has been with Zoho for 19 years. After graduating from the prestigious College of Engineering, Guindy (CEG) in Chennai, she joined Zoho Corp as a software engineer. Working on various high-tech products in the company has given her rich knowledge in the field of software product management. Her expertise covers a huge range, from database scaling and network monitoring, to application performance tracking and end-user-experience analysis. Her greatest asset is the profound wisdom that she has gathered through the years on how to innovate and improvise on an idea, how to rally a team around it and how to execute it to perfection, consistently ahead of the competition.